As a part of your emergency planning process, plan to stay informed. Tune into local news broadcasts via radio or television before, during, and after emergencies to be sure your getting the latest information. You can also go to the County's main website to check for updates. Subscribe to Alert Montgomery to receive emergency alerts from Montgomery County directly to your mobile devices. Through this service, Montgomery County officials can send event updates, warnings, and instructions right to you. With Alert Montgomery, you can pick and choose what categories you would like to subscribe to, such as: severe weather, severe traffic, public health, school closures, community use of public facilities, and more. This is an accessible emergency notification service provided by the County to send alerts via text, email, phone, and TTY/TTD to people who live or work in the County. Do you have an emergency plan for yourself, family, or friends? If not, National Preparedness Month is the perfect time to look for resources and create those emergency plans! Creating your Family's emergency plan doesn't have to be difficult or expensive. OEMHS has plenty of resources to help you get started with your plans! Our Are You Ready? 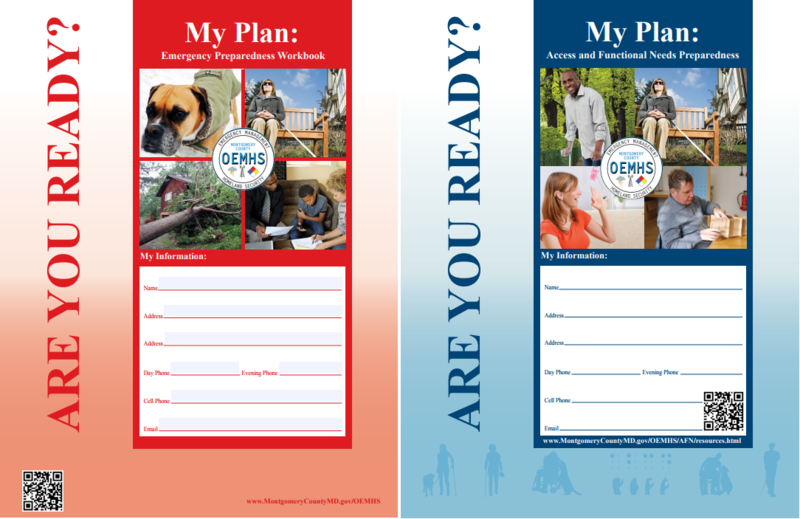 Emergency Preparedness Workbooks are a fill-in-the-blank emergency plan that also includes a guide for local sources of information. This workbook can help you keep all of your emergency information in one place, such as: Insurance information, contact information for doctor's and specialists, veterinarian contact information, as well as contact information for your support network (ie. family and friends). This workbook is available in English , Spanish , French , Simplified Chinese , Amharic , Korean , Russian , and Vietnamese . If you would like a hard copy of this workbook, please call 3-1-1 or send an email to Emergency.Management@montgomerycountymd.gov to place your request. One of the most critical steps you can take to sustain yourself and your family during a disaster is to create an emergency kit before the disaster strikes. An emergency kit contains items you might need during an emergency to sustain yourself and your family. These items will help you if you are asked to stay home for as many as three days. Get involved in emergency preparedness by helping your community! Request a speaker from OEMHS to come and speak on emergency preparedness at your organizations next event. Routinely check our website and social media pages to see what community trainings are being offered. Lastly, check out some organizations involved in emergency preparedness and volunteer!